John Blount began a lifelong investment in Rotary when he joined the Rotary Club of Sebastopol at the age of 27. He recently completed two years on Rotary International’s Board of Directors and then chaired RI’s global Communications Committee for two years. 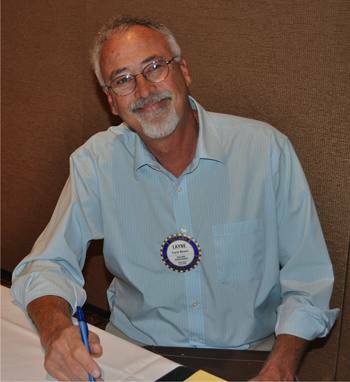 For the past 26 years he has trained leaders in business, Rotary clubs, and Rotary International and has developed many of the training programs for Rotary in the western United States and Canada. 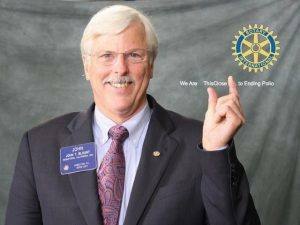 Dr. Blount is a dentist in private practice in Sebastopol, California but his background as a musical performer, motivational speaker, and writer and producer of multi-media presentations guarantees a delightful experience for those who enjoy hearing about Rotary and what it accomplishes. 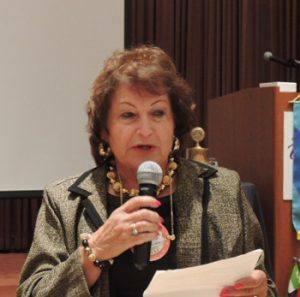 President Peggy began todays meeting of the “Finest” Rotary Club in District 5130 with her usual beautiful smile! The pledge was led by the inimitable Ray M. is for “Mudflaps, not Marvin” Dorfman. What if you could start the day without caffeine? What if you could always be cheerful, ignoring aches and pains? What if you could conquer tension without medical help? …Then You Are Probably …….. 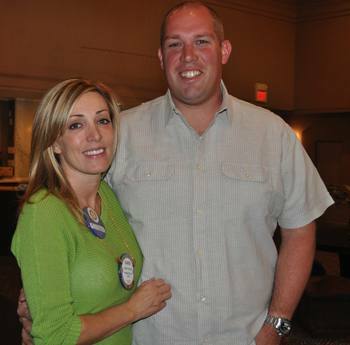 The only visitor from another Rotary Club was Troy Engold from Fortuna. Several guests were present today including: printer, Bart Eddy, a guest of Karen Ball, Josh Hochberg, hosted by Tim Delaney, Cole, Cindy and Scott Larson, and Montgomery High School principal Laurie Fong, guests of Bill Hatcher. A couple of female Rotarians, Marnie Goldschlag and Carrie Ludtke were accompanied by their “significant others” Eric and Josh. (What is the opposite of a “Rotary Annie?” ) Also in attendance was today’s guest speaker, The Honorable Judge Rene Auguste Chouteau, Presiding Judge of the State Superior Court. Penny Tibbetts expressed condolences to Matt Everson for the passing of his father after a lengthy illness. She also reported that Nick Knickerbocker’s wife, Camille, has been in the hospital for a number of days after a fall. Please send positive Rotarian thoughts and prayers for both of them. 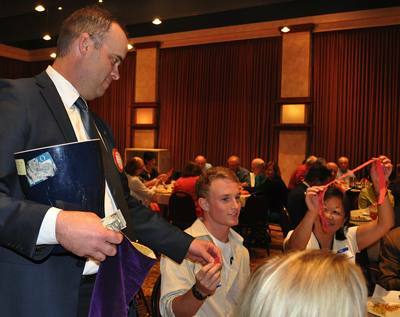 Jason Black presided over the raffle but again, the person with the drawn ticket, in this case, guest Laurie Fong, failed to draw the Lucky Joker and walked away with a $10 bill. Debra had to pay $10 in order for her last name to be changed to Dorfman on her name tag. The oldest of eight children, Jane grew up in Denver and claims that she inherited her Wonder Woman powers from her teenaged mother, who not only worked but maintained an immaculate, disciplined home, including the daily laundry, always finished by 9 am. Her dad worked as a truck driver and liked solitude and peace & quiet, which he found hanging around with his younger brothers. When Jane was 18, she married her husband Jerry, whom she called “the best real estate broker at creative financing I had ever seen”. Jane’s mother quickly grasped Jerry’s career and began to invest in potential housing bargains, “flipping” property years before it became popular, even the family Victorian! A number of years later, the buyer of the old Victorian defaulted and Jane’s mother foreclosed on the old home with only one problem—no money, children to raise, and a two-story home that needed a new roof with the Denver winter fast approaching. No problem…she and her younger brother re-roofed the steep roof themselves! The elder Wonder Woman taught her family that “if it needs to be done, do it today!” Sadly, Jane lost both her young parents, killed in a car accident by a drunk driver. David Brown announced that 6 foursomes from our Rotary Club have will be playing in the YMCA Golf Tournament this Friday. Past Presidents Ray Dorfman and David Brown also will participate in the putting contest. 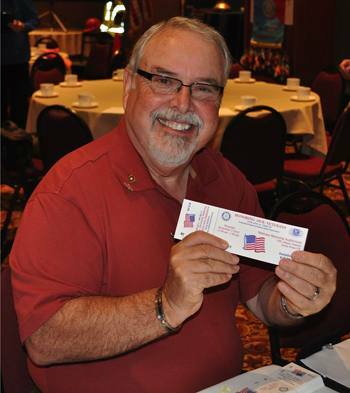 Ray also announced that tickets remain for the upcoming joint Rotary/Kiwanas Veterans Program in November. Our club will be dark that week. If you have not attended one of these Veteran’s meetings, please find a way to attend. It will stir your patriotic soul to recognize the heroic efforts of our present and former service personnel. Mike Kallhoff announced there is still room at the Rotary table for the upcoming 10th Annual Employers Best Practices Awards breakfast here at the Flaming-O on October 30th at 7:30 AM. Contact Mike or Jack Geary for details. 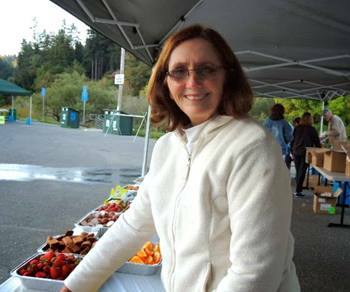 Debi Zaft is still looking for auction items for the Casino Royale fundraiser. Congratulations to Don McMillan for the generous $500 sponsorship. 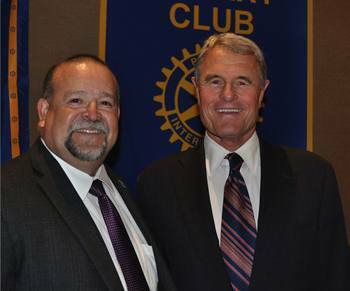 Ted Wilmsen wants to encourage 501C3 organizations to apply for Rotary Foundation grants. If you know a great organization looking for grant money, please let them know about this opportunity. 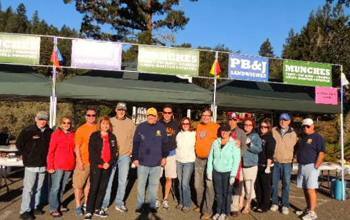 The Rotary Club of Santa Rosa and Santa Rosa Cycling Club have a great working relationship that is “beneficial to all concerned”. 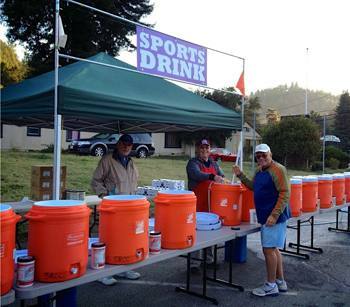 Each year our club supplies personnel to man the Monte Rio (and other) rest stops in exchange for the use of equipment owned by the Santa Rosa Cycling Club at our Giro Bello event. 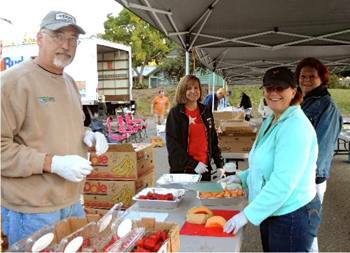 This year, as always a number of Rotarians from our club unloaded trucks, sliced and diced fruit and formed a PB&J assembly line to nourish the Gran Fondo riders. Many of the riders tell our members what a great job we do and it gives us the opportunity to promote our Giro Bello directly to the riders. 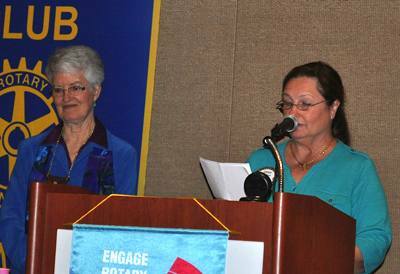 Great job, Rotarians! 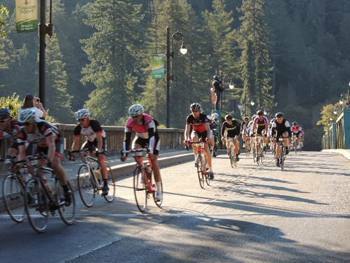 Scroll to the end of this issue of The Santa Rosarian to see a collection of photos from the Gran Fondo. Even more can be seen in the gallery at Gran Fondo 2013 Photo Gallery. Wayne Rowlands will again be hosting a barbecue social at his beautiful home next Tuesday evening. 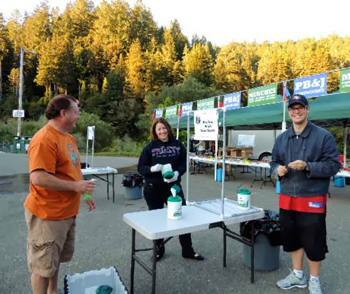 At the barbecue, you will have the opportunity to bid on cuts of pork and lamb that were purchased by the club at the Sonoma County Fair from 4H youths.. Don’t miss it! Bill Hatcher presided over the recognition of todays honor student, Cole Larson from Montgomery High School. To introduce Cole and tell us about his accomplishments was Principal Laurie Fong. According to Ms. Fong, Cole is an accomplished young man with a better than 4.0 grade point average for as far as the eye can see. He is a member of the winning Viking football team, student body president and is in the baccalaureate program at Montgomery. He has applied for early entry into Stanford. 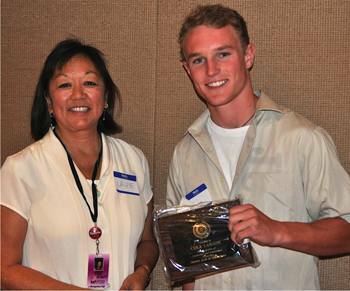 In his acceptance of our Rotary recognition and check for $100, Cole presented himself as a well-spoken, humble young man. He gave credit to his parents for their positive guidance as well as his school, organizations such as Rotary and his community. This is a young man who will go far in life. President Peggy broke out the photos and acknowledged the activities of some of our members. 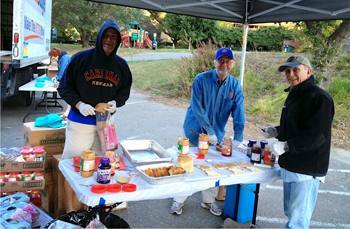 Wayne Rowlands and Rich de Lambert won 2nd place in a chili cook off fundraiser sponsored by the Evening Rotary Club. For that, they won a silver spoon! The boys looked great in their chef’s hats! Ryan Thomas was shown holding his forty-something pound catch on a beach in Baja California. Some version of this dorado (also called mahi-mahi) has been allegedly served at our meeting recently. No word yet as to whether it was THAT specific fish or not. Ryan donated $100 to his Paul Harris. Marnie Goldschlag and Carrie Ludtke were cited ($100 and $50 respectively) for running an unauthorized Rotary meeting in a casino bar in Las Vegas last week. Ignoring Marnie’s pleas that, “What happens in Vegas stays in Vegas”, Carrie posted a few Facebook photos of her and Marnie’s “meeting”. (rookie mistake!) Word has it that Carrie also apparently tried her hand at some sort of working girl intervention, but few details emerged. Carrie and Marnie were actually celebrating Carrie’s birthday and the publication of her new book. More about that to come in a future edition of the Santa Rosarian….. The Honorable Judge Rene Chouteau was introduced by our own Jose Guillen. 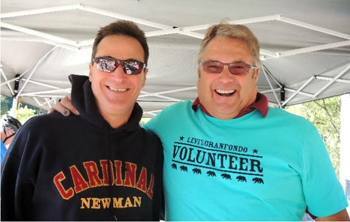 The Judge and Jose work closely together at the Sonoma County Court and obviously have tremendous respect for each other. The Judge shared with our group some of his experiences as both a Santa Rosa City Attorney for twenty years as well as his previous tour as a San Francisco City Attorney. He related a humorous story of his part in the eviction of a questionable character who had been hired to run a city owned golf course but who never paid rent. In his defense the operator stated that he had paid a bribe to Mayor Alioto so he didn’t need to pay rent. At some point during the proceedings, Mr. Chouteau had an “apparel malfunction” and had to present his case sitting down. Moving on to the Court and his judgeship, The Honorable Judge cited some of the challenges facing the court. Judge Chouteau noted that the business or product of the court is “justice”. While the court has absorbed a 30% cut in funding over the past five years, the Judge credited our own Jose Guillen for his work in cross- training personnel to increase efficiency. He noted that the court is also using improvements in technology to help them do more with less. Judge Chouteau cited the child custody cases as those most affected by budget cuts. Cases that used to be settled in 4-6 weeks now can take 6 months to settle, causing hardship on the children, especially. In discussing possible changes to make the court function more efficiently, Judge Chouteau noted that one idea gaining traction is moving to a smaller jury of 6 or 8 for misdemeanor trials instead of the usual 12.